Hello friends! Giovana here today sharing a couple of card I made using this super cute set from Joy Clair Stamps, it is called "Best Buds"
BTW, The girls at My Sweet Petunia are having fun with the Joy Clair team this month. prizes: 2 $25 Joy Clair Gift certificates and one MISTI - your choice of original or mini. 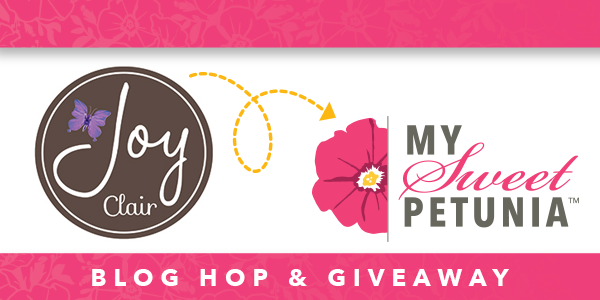 Winners will be announced in April on both the My Sweet Petunia and Joy Clair blogs. Ok, now, let me show you the cards I have for you today! Both cards use "Best Buds". I stamped the images using my Original MISTI on watercolor paper in Jet Black Ink, then colored the images with Spectrum Noir Aqua Markers. I die-cut the images with stitched dies, and backgrounds were die-cut from patterned paper. Don't you love these images?! I think they are adorable!! Hope you like these projects. Love the Best Buds set! Adorable critters on these sweet cards! Love your pretty watercoloring too! So cute, Giovana! Your coloring, especially on the turtles, is beautiful. Such a sweet set of friendship cards. Those sweet turtles are my favorite (& love the sentiment to go with!). on the bunny card. Perfect. on the cards. Darling cards. Cute critter scenes you created. I like the grass and clouds and your coloring. Thanks so much for sharing your adorable creation! Awww Giovana these are both so sweet. The bunnies are adorable and the turtles (esp. the little one) crack me up every time I see them. L♥VE! What sweet cards! I love your use of patterned paper and water coloring. Awwww they are so very adorable cards for friends. Love the scenes on both bunny card and turtle card. Your two cards are adorable ! I love the soft colors. These are definitely adorable! Love them both! both cards are just too darn precious! Love them! Your cards are ADORABLE, Giovana! The little critters are SO CUTE! LOOOVE the bunnies AND the little turtles are EVER SO CUTE TOO!!! AND your soft touches of water coloring are PERFECT with these SWEET IMAGES!!! ;) SUPER JOB on BOTH of your cards! Aawww !! These bunnies are so adorable ! !